The wintery weather can sometimes make January a very bleak month, with it’s cold short days and even colder long nights. Spare a thought for our wild creatures struggling through the wind & rain in a constant battle for survival. On a rather windy day on the 3rd weekend in January I went to see what I could find around Tralee Bay’s Marshes & Mudflats. The first things I spotted are two different species of the Duck family. 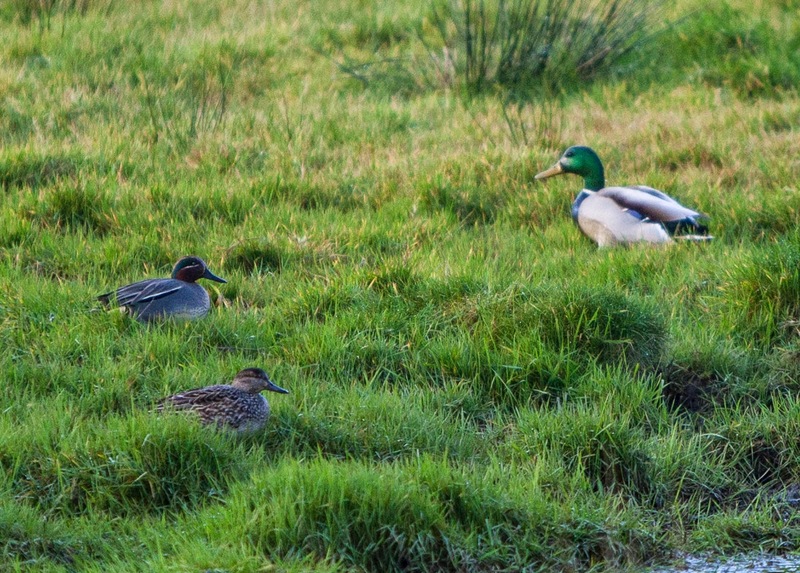 The Teal is a very small Duck, Irelands smallest (34-38cm). The Male has superb markings and a rusty red head with a emerald green band running across its eye, quite a striking bird when viewed through binoculars. 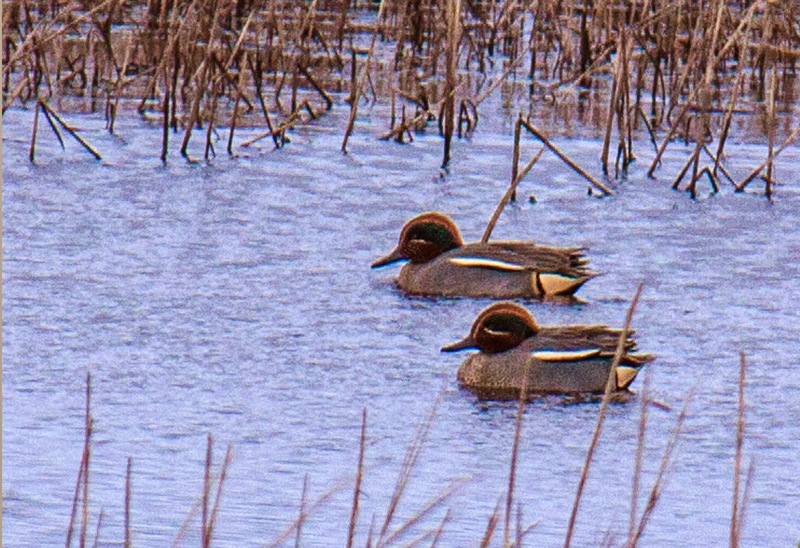 The Female Teal has mottled brown markings, great for camouflage when on the nest, similar to the female Mallard. Next to them was a Male Mallard (50 - 65cm), this too has beautiful markings, with its bottle green coloured head and bright yellow beak. I attempt to get closer to get a better photograph but they quickly fly away. Moving further along in a marshy area with plenty of reed cover are 4 more Teal who rose up almost vertically not long after I spotted them and called the alarm as a Kestrel shots by them and away over the surrounding fields. The Kestrel would be on the look out for smaller prey than a Teal but in nesting season a duckling would probably be on his menu. 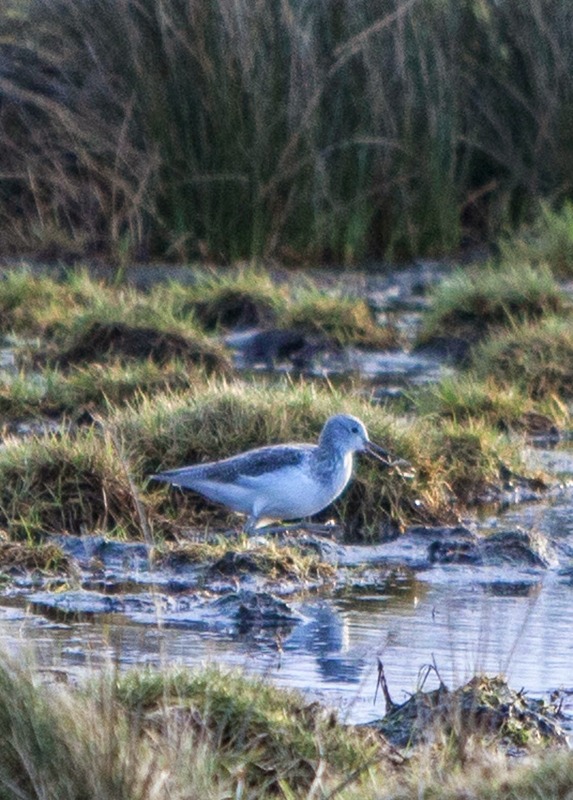 Nearby in a water pool at the grassy edge was a Greenshank (Wader 30 - 31cm) in winter plumage, they poke their long beaks into the mud and snap up whatever they can find. The one in the photo is catching a small frog lying dormant deep down in the mud (see photo). Like a lot of Waders the Greenshank changes its plumage when the season changes. Greenshank eggs were quite a trophy to have when egg collecting was the fashion way back in the dark days of the past. Overhead a large number (500+) of Lapwings flew by and are over Wintering on Tralee Bay. They like to rest in the fields when then tide is in and then feed on the mudflats when the tide is out. Often spotted with them are Golden Plovers a very small bird, they have a Golden glow about them with their brown feathered backs. Also a partial Winter migrant. 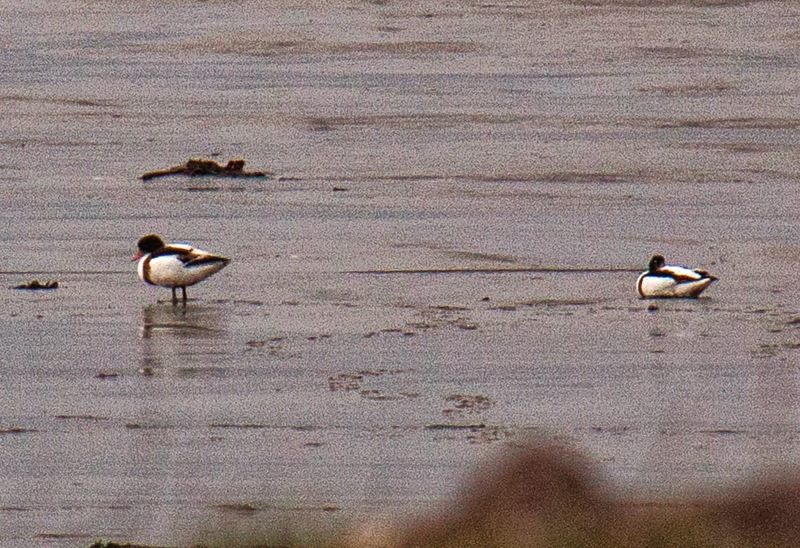 Then I spot Irelands Largest Duck The Shellduck 58 - 65cm, there were a pair way off in the distance on the mudflats. A beautiful Goose like bird, mainly white with a dark head and bright red beak. It nests in a burrow like a Rabbit would do, in undisturbed quiet areas around rivers & estuaries. So we have the smallest and the largest Ducks in Kerry too. In many estuaries in the winter time you will find thousands of waders of many kinds one in particular which very much overlooked is the Turnstone (Wader 23cm) a small bird dark in colour white belly with red legs. A visitor to our shores with superb camouflage. 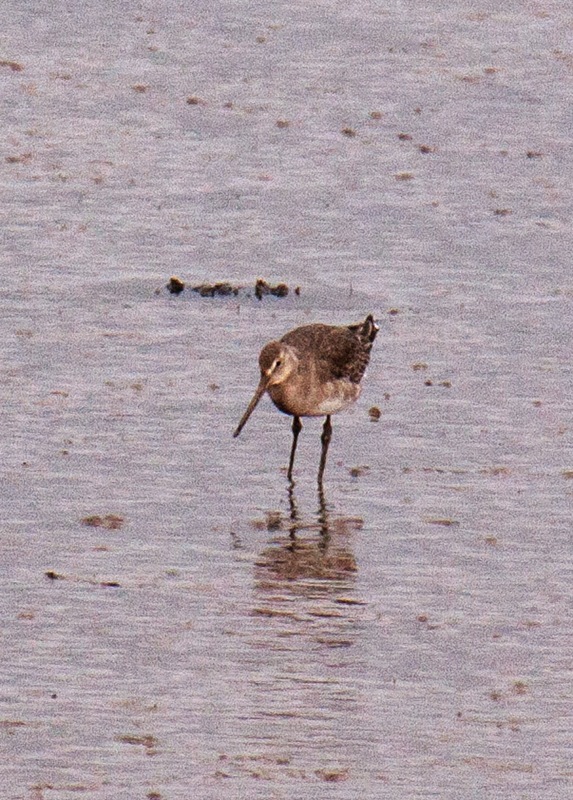 The Bar Tailed Godwit (Wader 38 - 42cm) which looks a little like a Curlew at this time of year but smaller in size. These small birds have flown all the way from the High Arctic region of our planet travelling thousands of miles with the other Winter migrating birds on incredible journeys across mountains and seas, day and night to get to Ireland for the winter. My walk came to an end and on reflection the Winter is a great time to see bird life on Irelands marshes & estuaries. Our wetland areas are so rich in their biodiversity and some are just on our doorsteps so why not get out there to witness such amazing creatures, I counted at least 25 different species of birds spotted on that day, here is a list of what I saw: Teal, Mallard, Mute Swans, Lapwings, Kestrel, Golden Plover, Greenshank, Redshank, Bar Tailed Godwits, Turnstones, Shellduck, Rooks, Jackdaws, Hooded Crows, Curlews, Grey Heron, Egret, Black Headed Gulls, Common Gulls, Herring Gulls, Oystercatchers, Shag, Stonechat, Pipits & lastly not forgetting the beautiful Brent Geese who deserve a write up all on their own…. Get out there for yourself and see natures magnificent winter migrating birds before they head North for the spring, see how many you can identify you will be amazed. 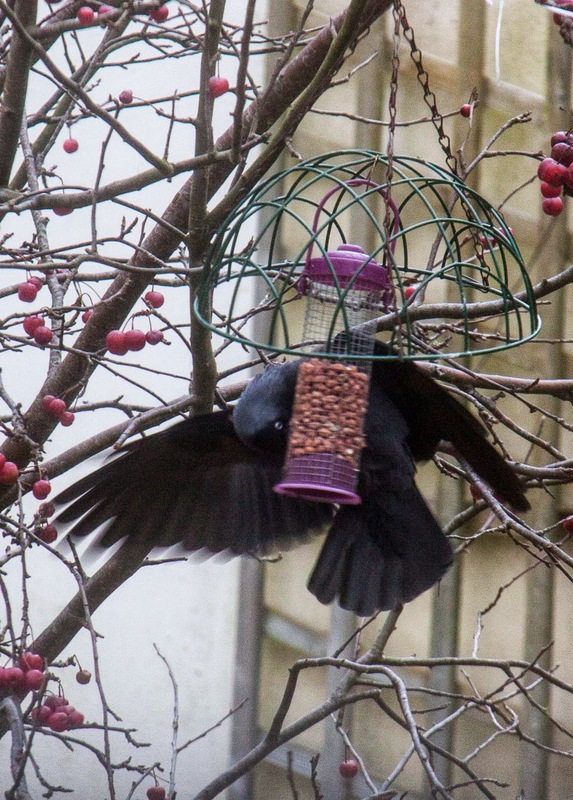 Do you have a problem with Rooks opening and spilling the peanuts from your feeders in your garden? Some actually fly away with the feeder to gorge on the bounty of peanuts around the corner. Maybe you have just given up feeding the birds because of those pesky Rooks. Rooks are so clever but you want to feed the smaller birds too, right? Here is how to beat them and also recycle some of the stuff you probably have at the back of your shed. Get an old metal hanging basket cage with no moss inside it then hang it upside down from a tree or wherever you usually hang them your feeder. Fix your peanut feeder with wire or an old keyring metal ring attachment to the hanging basket it, it must be detachable so you can fill it up with more peanuts when empty. The basket should look like an umbrella shaped cage over your feeder. The Jackdaws can get to the nuts but the feeder will stay in place for all to enjoy (see photo). Hang it high enough so the local cat can’t get at the birds too! Throw out your old stale bread for the Rooks instead, they need to eat also. Have any of you garden bird lovers out there used a window seed feeder that attaches to a window? We would love to know how you got on and what type of birds come to your window. I have seen 30 - 40 Goldfinches nearly every day hanging around a garden just outside Tralee town, can you beat that! Get snapping and send your images and comments in. The email is as usual iwtkerry@gmail.com.